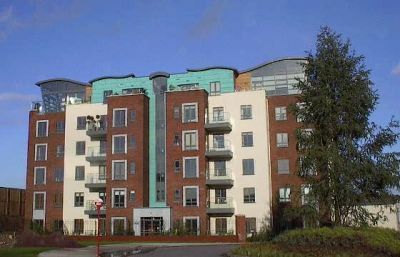 This two bedroom self catering holiday apartment is located at Jacobs Island Cork across from the Mahon Point shopping mall. It is ideal for a short break in Cork. The apartment is on the second floor with designated parking in the basement for one car only. Lift access from the basement .The master bedroom has oak flooring , double bed, and ensuite shower off it, the second bedroom has oak flooring double bed . The main bathroom has a pumped shower over the bath. Polished porcelain tiling throughout with a kitchen living area that has a fully fitted kitchen with all appliances, dining table for 4 , reclining leather couches , free to air satellite reception, a balcony that catches the early morning sunshine where you can watch the boats entering Cork harbour. The balcony overlooks a landscaped water featured court yard . Access is through electric coded gates, on the no10 bus route and about 5 miles from Cork airport . It is accessed just off the N25 ring road. Bed linen & towels supplied. Electricity & heating is included in the cost . Mahon Point shopping Mall is just across the road with shops like Tesco, Debhenams, B& Q currys, McDonalds ( that have free wifi in their dining area ) Cinemas , restaurants & pubs all at the door step. Cork City had indoor food markets like the English Market , Opera house , open top tour buses , Frommers have named it in the top 10 places to visit , Blarney Castle, Shandon bells , Fota Wildlife park & gardens, Gold courses at Kinsale & little Island , & Mahon. Cork Medical Center Corks newest private hospital is a short walk.